One of my most popular series of reviews has been my Sunday lunches, on that list Hart’s is one of the best scorers for a roast. Despite it being a stalwart of the Nottingham food scene I haven’t reviewed their evening offering, they have set lunch and evening menus but the a la carte was the place for us on this visit. If you don’t know where the restaurant is by now you might be beyond hope, it sits at the top of the steps to the park, not far from the castle. They have refurbished over the last few years but the feel remains the same, low lighting, quite traditional. This works well for the bulk of their clientele as it seems to that the grey pound is firmly represented every time I have been. I always look forward to bread when visiting somewhere like this, though on this occasion it was a listless couple of options. A couple of average sourdough’s, I expect better from a restaurant with links to the excellent Hambleton bakery. I went for a game theme to my evening that started with a dish of quail. It arrived well cooked, a skill not to be underestimated on a little bird like this one. The rest of the dish was pleasant, a middle eastern inspired combination of grains and pomegranate seeds. It worked but I longed for a rich sauce and some earthy vegetables to really bring the quail to life. 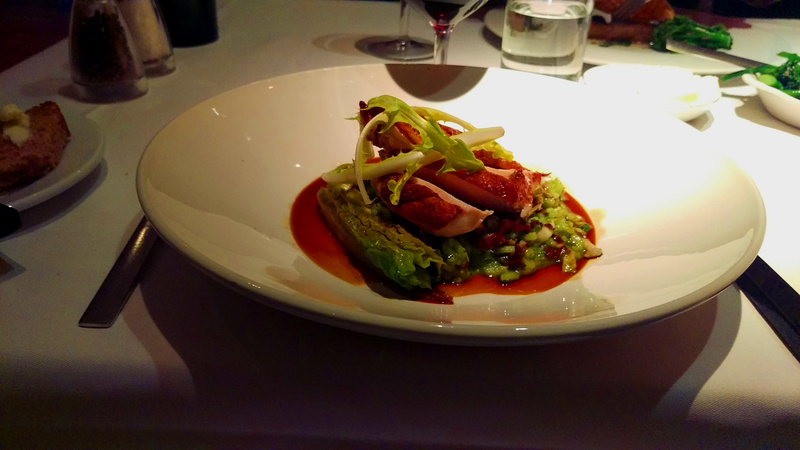 Guinea Fowl was an excellent looking plate of food, cleanly presented and perfectly cooked with a little crispy skin. One of the best things I had eaten in a while. The rest of the plate delivered where maybe the starter hadn’t, a gamey jus and wild garlic risotto working in harmony. The addition of bitter chicory and grilled lettuce added both a depth and freshness, this was seriously good. I decided to finish with something rich, a dark chocolate parfait. It was as luxurious as you would expect, a malted banana ice cream with it having particularly strong flavour. A little granola-like mound in the corner added some texture but passion fruit was an unwelcome distraction. There was already plenty going on on the plate and the sharp, strong flavour of the passion fruit dominated the other flavours. 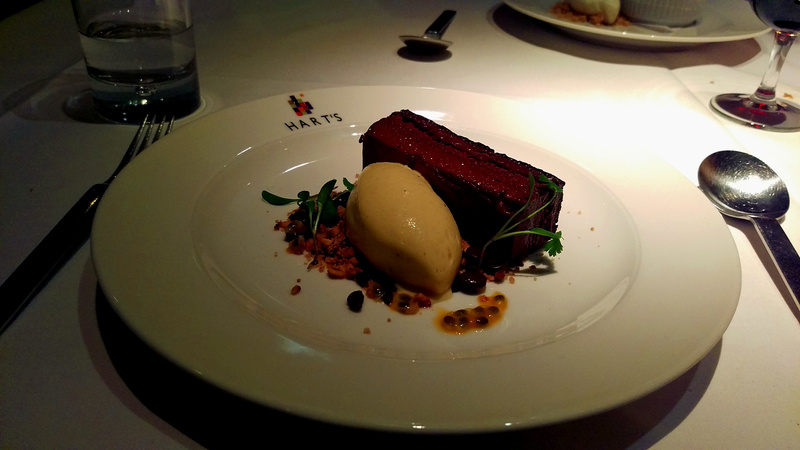 Hart’s isn’t a bargain, though their set menus do represent good value and you can do it on more of a budget. On this occasion the guinea fowl set me back, £17, certainly value for that dish. When you consider that a burger (albeit a good one with chips) at the recently opened Purecraft is £15 and mussels at Belgo are £13.50. The skillful cooking and quality ingredients on display here makes me believe that the cost is worth it. The service wasn’t particularly formal, in fact it was a little in the opposite direction and I felt the courses came out in too quick succession. You aren’t going to be challenged or wow’ed by the ambition of the food here, it is just good, consistent cooking. 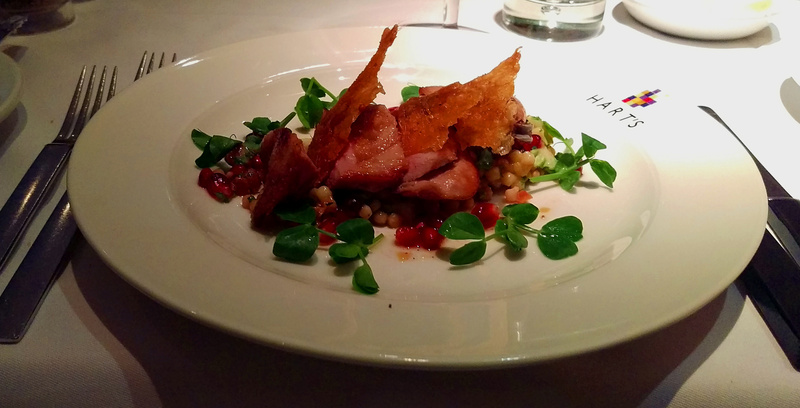 Hart’s continues to deserve its place at the top of Nottingham’s food scene.